Organic Wheat Grass (young leaf), Organic Green Tea Extract (leaf), Organic Carrot powder (root), Organic Broccoli powder (aerial parts), Organic Cauliflower powder (aerial parts), Organic Kale powder (aerial parts), Organic Parsley powder (aerial parts), Organic Spirulina (entire plant), Organic Chlorella (entire plant), Organic Milk Thistle Extract (seed), Organic Beet powder (root). Organic Raspberry powder (fruit), Organic Tomato powder (fruit), Organic Acerola Extract (fruit), Organic Strawberry (fruit), Organic mango (fruit), Organic Mountain Cranberry (fruit), Organic Hawthorne Berry Extract (fruit), Organic Apple (continued on reverse) (fruit), Organic Black Currant powder (fruit), Organic Pomegranate extract (kernel), Organic Blueberry powder (fruit), Organic Acai (fruit), Organic Plum Extract (fruit). Organic Gum Acacia, Organic Flax Seed powder, Organic Inulin and an Enzyme Blend of Cellulose, Protease, Amylase and Lipase. Other ingredients: Organic Flavours (Vanilla and Strawberry), Organic Stevia Extract and Citric Acid. Based on ORAC recommendations, we should be consuming nine to thirteen servings of fruits and vegetables a day. The ORAC value for Organic Greens and Reds is approximately 3,000 µmoleTE per serving which is the ORAC equivalent of 3-4 servings of fruits and vegetables. 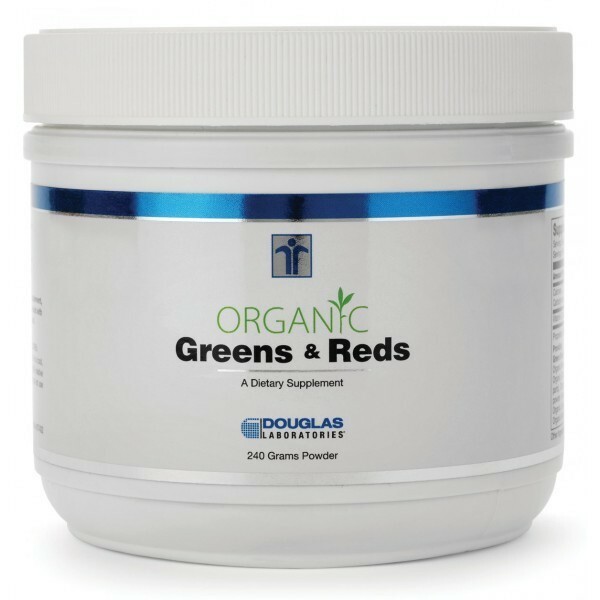 While dietary supplements do not take the place of a healthy, well-balanced diet, Organic Greens and Reds is as an excellent way to help meet the daily fruit and vegetable serving recommendations. INDICATIONS: Organic Greens and Reds may be a useful dietary supplement for individuals wishing to supplement with a healthful combination of phytonutrients.